Library Events Room (B.135), Palais des Nations, B Building, 1st floor. 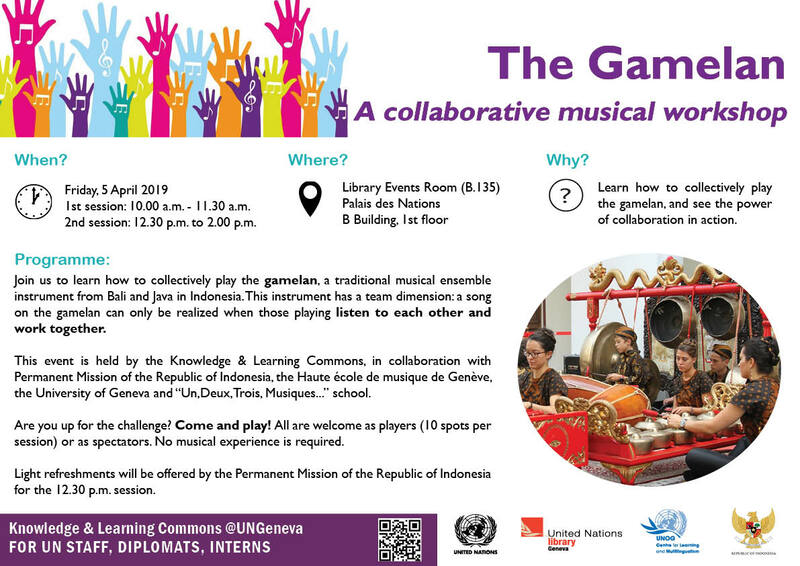 Learn how to collectively play the gamelan, and see the power of collaboration in action. on the gamelan can only be realized when those playing listen to each other and work together. the University of Geneva and “Un,Deux,Trois, Musiques...” school. Are you up for the challenge? Come and play! All are welcome as players (10 spots per session) or as spectators. No musical experience is required. Light refreshments will be offered by the Permanent Mission of the Republic of Indonesia for the 12.30 p.m. session.